While you never know what type of weather you’re gonna get in the middle of January in the Mid-Atlantic, it’s a safe bet that warm will not be part of it. This usually isn’t a big deal for me, yet for some reason I couldn’t figure out what to wear for the race. The complicating factor wasn’t the temperature (30 degrees), but the wind that felt hurricane strength at times. On the walk over to the activity hall, I couldn’t stop my teeth from chattering. Any normal person would just toss on another layer and move forward, but I kept waffling back and forth on how many and what kind of layers to go with for fear of overheating once I finally got running. As if this was ever really a risk in these conditions. I could have taped a dozen hand warmers to my body under four layers and still not be too hot. In the end, three layers with a hoodie and hand warmers in my gloves kept me comfortable for the entire day. The wife and I before the start. The confused look on my face is because I still haven’t figured out what to wear yet. There was a decent amount of rain the day before the race so this year’s course was altered from years past. 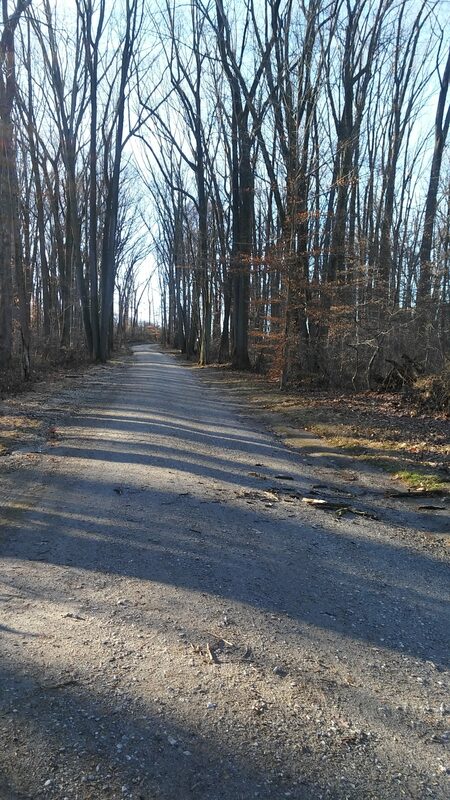 Most of the single track trails were removed and replaced by gravel carriage roads. 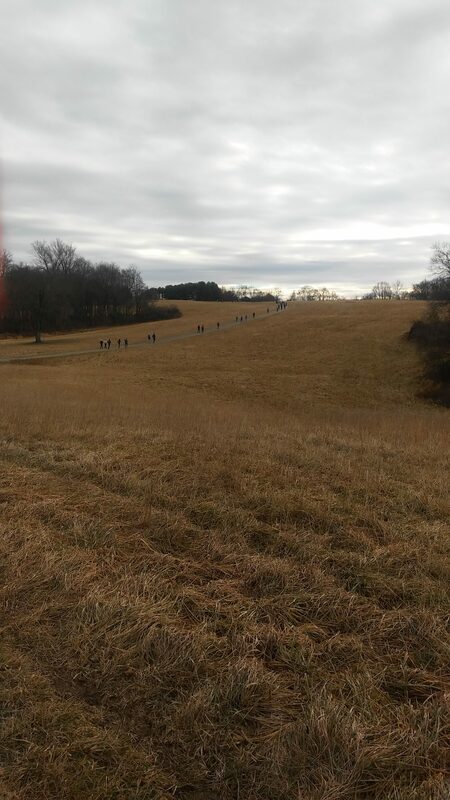 I had run this race the prior two years so this was a great way to see other parts of the Fair Hill Natural Resource Management Area that I hadn’t seen before. The first mile and last half mile were the same along with several connector trails, but the rest was brand new to me. Normally the course measures right at 31 miles for the 50K with 3600 feet of elevation gain, however this modified course was almost 33 miles (32.74 per my Garmin) with just under 3400 feet of elevation. The bonus mileage almost brought the cost down to $1 per mile. 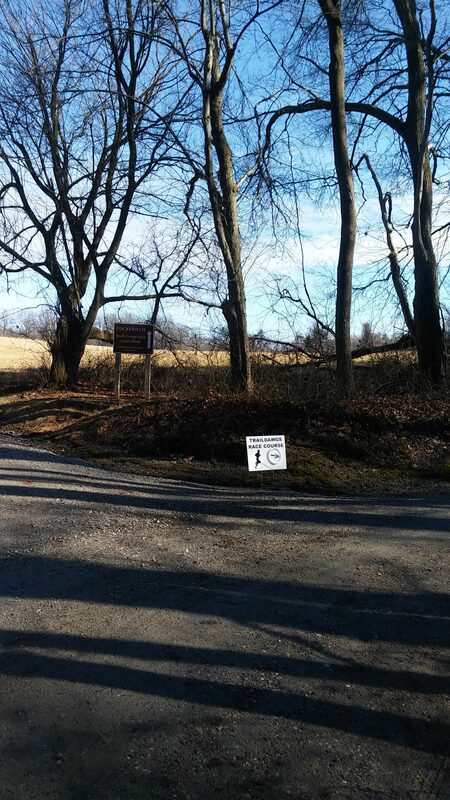 One of the new sections of the course this year right after the first snack bar at mile 5. You can tell it’s still the first loop because of all the other runners in the picture. The start of the race is a little unique and always cracks me up. The race director, Carl Perkins (no relation), has the activity hall rented for the event and this is where everyone hangs out until the race starts. When its time to begin, Carl leads a parade of runners out one end of the building, around this little track, and then to the start. In years past, he’s started the race before the middle of the pack even knows what is going on. This year, I got myself positioned right up front so of course he waited an extra couple minutes to get things going. Luckily, I wasn’t too cold waiting around as all the other runners around me blocked the wind. If only we could all run bunched up like this for the next 6 hours. Carl didn’t take all the single track out of the course redesign. Just most of them. And we did for the first mile. Then we took a left onto a new trail section and ran single file for the next little bit. 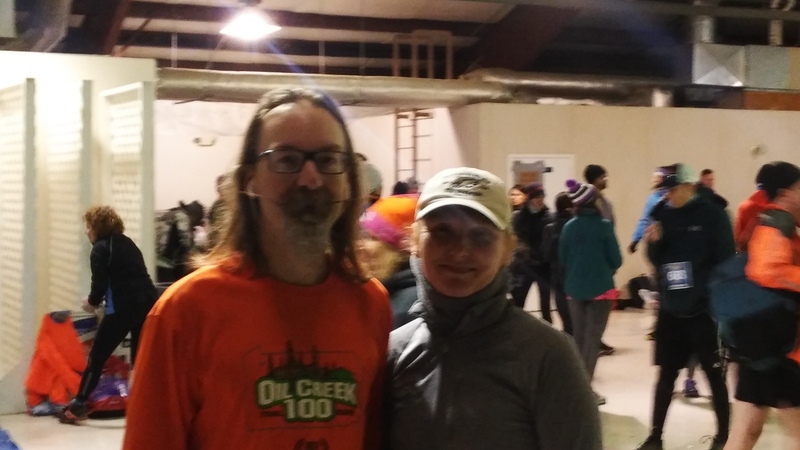 With 435 finishers (355 for the 25K and 80 in the 50K), it takes quite a while for people to get spaced out. It wasn’t until 8 miles in that I started to feel a little less claustrophobic. Not that I couldn’t easily maneuver around people before then, but I’m used to races were I’m out by myself for almost hours on end without seeing anyone else (wait for it). 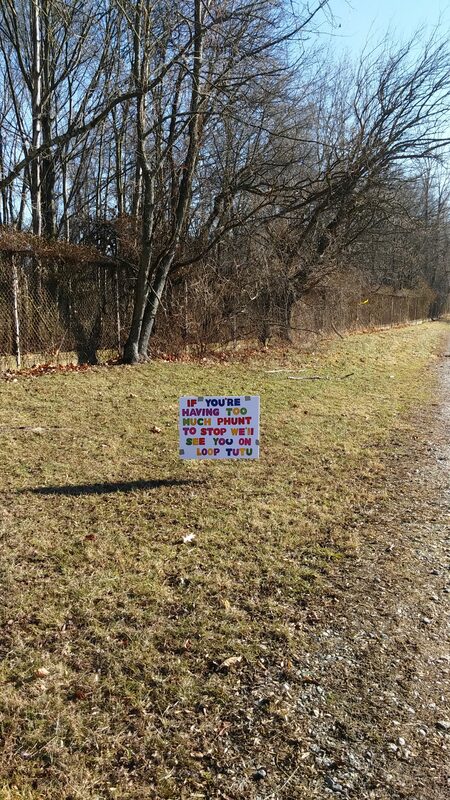 There are usually tons of funny signs out along the course. This one just past the third aid station must have been put up for Keith Straw who I noticed in the results finished not too far behind me. The first aid station was at mile 5 and I blew right by it without stopping. I was running with two 20oz bottles (one water, one Mountain Dew) and didn’t need any refills yet. One other person in my pack kept going, but the other 8-10 peeled off to get some refreshments. All three aid stations (or snack bars as my wife calls them) were well stocked with the normal ultra-fare (candy, nuts, grilled cheese, sodas, gels, etc.). They even had fires going in case you wanted to stop off and warm up for a bit. If you have any interest in maintaining a good pace though, you’ll stay as far away from them as possible. And while I wasn’t planning on setting any speed records with my lack of training heading into the race, I was hoping for a somewhat respectable time. 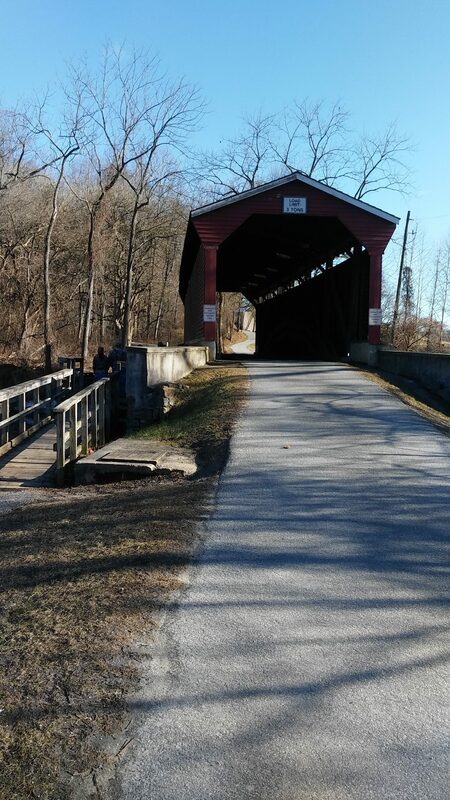 This bridge was just past the second aid station and has been part of the course in prior years. I glanced at my watch at every mile and was mildly surprised to see rather respectable times flashing across them. Lots of 10 minute miles and the occasional 9 would pop up on my screen. The course was quite a bit faster than the normal one, however in the end it was offset by the extra mileage. But I was feeling great and not too concerned with my time. My legs started getting tired at about the half marathon mark (#AsExpected), however my nutrition was rock solid (supplemented by several Ensure Plus shakes) and kept me cruising along. I rolled into the start/finish line at 2 hours 53 minutes with a bunch of other runners. They had a small aid station set up about 5 feet from the entrance to the activity hall, which I stopped at to top up my Mountain Dew. It’s funny to look back and realize I never once entertained the thought of heading inside to warm up and partake of all the actual food they had. I’m typically highly focused on getting in and out of aid stations as quickly as possible and that was definitely the case Saturday. As I left for the second loop, there was no one within sight ahead of me on the road. I turned around and only one of the runners I came in with was right behind me. All the rest were just running the 25K. All the turns were well marked so it was impossible to get lost out there. So began my lonely loop. I thought about dropping back and running with my fellow 50Ker about a mile in, but I’m not the most gregarious person in the world. Not that I’m anti-social by any stretch of the imagination. Its just that I love being out in the woods by myself. Outside of the aid station volunteers, I only ended up seeing 7 others over the last 3 hours of my race. Two came up close behind me and four that I ended up passing plus a 25K walker. Amazingly enough, I never got passed myself. Typically, I’m the one getting blown by as I slowly (or at times quickly) fade over the second half of races. My pace definitely dropped, however my second half split was only about 20 minutes slower than my first. And while my legs got more and more tired as I went along, emotionally I was still very up and thoroughly enjoying my time on the trails. Even when I started counting down the miles after the marathon mark, it was more an academic exercise rather than my typical “I’ve still got how many more [expletive deleted] miles left?!?!”. And then I was across the finish line and lugging my 15 pound finisher’s medal into the activity hall where I hung out for a half hour before heading home to watch my beloved Iggles beat the Falcons. A great end to an awesome day. Only about a half mile left from here. Trust me when I say the hill is much steeper than it looks. I can’t recommend this race enough to someone looking for a mid-winter trail race (not that you’re spoiled for choices in the area). The aid stations and volunteers are awesome. Even with the increased cost for 2019 (a whopping $42 for the 50K), this is still a great value as you got a pint glass, buff, ginormous finishers medal, along with food/beer and a DJ afterwards. Plus all the normal things you would expect (clearly marked trails, well stocked aid stations, humorous emails leading up to the race). The only problem is the race fills up quickly (only 102 of 600 spots left). 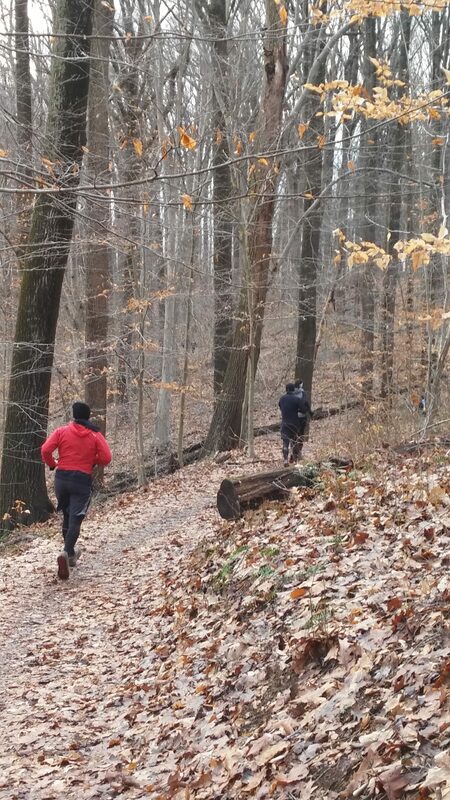 So if you’re interested in a great, low-key trail race, you’d better hurry and sign up. See you next year! I’m sure you passed me as this was my first ultra and I took full advantage of the marvelous aid stations (25 min total stop time) . Very nice report, the Dawgs who put this on really appreciate the kind words — glad you enjoyed!